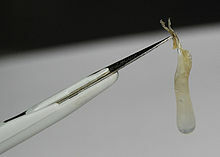 Dried nasal mucus, colloquially known as a boogie, snot, booger or bogey, is found in the nose. It is a result of drying of the normally viscous colloidal mucus, commonly known as snot. The mucous membranes in the nasal cavity constantly produce a wet mucus that lines the cavity and removes dust and pathogens from the air flowing through. For the most part, the cilia that also line the cavity work to move the mucus down the nasal cavity to the pharynx where it can be swallowed. Not all of the mucus stays fluid enough to be moved by the cilia. 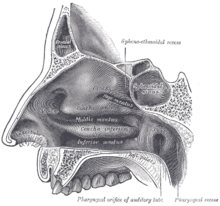 The closer the mucus is to being in the nasal vestibule and near the nostril opening, the more moisture it loses to the outside air, and the more likely it is to dry out and become stuck. Stefan Gates in his book Gastronaut discusses eating dried nasal mucus, and says that 44% of people he questioned said they had eaten their own dried nasal mucus in adulthood and said they liked it. As mucus filters airborne contaminants, eating it could be thought to be unhealthy; Gates comments that "our body has been built to consume snot", because the nasal mucus is normally swallowed after being moved inside by the motion of the cilia. Friedrich Bischinger, a lung specialist at Privatklinik Hochrum in Innsbruck, says that nose-picking and eating could actually be beneficial for the immune system. ^ "Booger - Definition and More from the Free Merriam-Webster Dictionary". Merriam-webster.com. Retrieved 2012-08-12. ^ "What's a Booger?". KidsHealth. ^ a b Gates, Stefan (2006). "Boogers". Gastronaut: Adventures in Food for the Romantic, the Foolhardy, and the Brave (paperback). Orlando: Harcourt. pp. 68, 69. ISBN 0-15-603097-7. ^ "Dr. Bischinger Friedrich: Lungenkrankheiten" (in German). Privatklinik Hochrum. Retrieved 2008-12-07. ^ "Top doc backs picking your nose and eating it". Ananova. Archived from the original on 2005-02-06. Retrieved 2008-12-07. ^ Bankhofer, Hademar (2007). "Nasenbohren" (PDF). Gesundheit kennt keine Tabus (in German). München: Südwest. pp. 10–15. ISBN 978-3-517-08373-5. OCLC 185006183. Retrieved 2008-12-07. This page was last edited on 7 December 2018, at 22:21 (UTC).